My dear in-laws are celebrating their 40th wedding anniversary today! !Yes,and this post is dedicated to them. I made sweet khichdi to celebrate the joy.I first tasted this dish with a big apprehension.The name khichdi was a deterrent as I am not too fond of the savoury version and when ma-in-law told me this is a totally different sweet I decided to take the plunge and liked it immensely.It is not a payasam nor a halwa,an in-between sweet which is usually made during special occasions,festivals etc. Roast channa dal and broken wheat separately till a nice aroma comes-about 5 minutes(do not brown it). Cook together in a pressure cooker adding enough water. Add jaggery and sugar to the cooked dal-wheat mix. Keep mixing-at this point the khichdi will look too thin and watery,keep stirring and it will thicken. Add grated coconut and 3 tbsp ghee. Roast the cashewnuts in the remaining ghee and add to the khichdi. Simmer for 10 minutes or till the khichdi becomes thick-pourable consistency. Garnish with chopped banana and serve hot. Update - Sending this bowl of Khichdi to Ashwini for the Lentil Mela. nice recipe..will try it for some festive occasion..congrats to your in laws..Happy anniversary.. Happy anniversary to them they look very happy! Mouth-watering khichdi. Its made with moong dal at my place. Lovely pic of your in-laws. God bless them. Happy Aniversary to your In Laws..40 years wow..Nice way of wishing them..yumm.Never tried with wheat..loos delicious..
Congratulations to your in laws and sweet kichdi is a great way to celebrate. Congragulations to your wonderful inlaws. Happy Anniversary to ur in Laws. Great way to honnor ur in laws with the sweet post and dish! A very happy wedding anniversary to your in-laws! This sweet kichdi is totally new to me! Looks awesome. HAPPY ANNIVERSARY TO YOUR MA-PA IN LAW! Wishing them many many more as well! looks delicious! happy anniversary to your in laws! Hi Divya, Ur FIL is my amma's cousin. Ask him shobha's daughter he will get it. ANd convey our Anniversary wishes to them as well. Btw Kichdi is tempting!!! 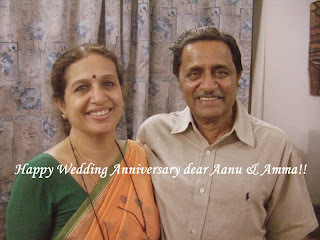 Happy anniversary to ur In-laws.. Hope they too enjoyed the sweet (I did it virtually)... Delicious! Divu, title Sweet Khichdi kellyari google search kartna ye post easily melta..wanted to tell u I knew only this sweet as khichdi was pleasantly surprised, when in secondary, learnt that savory version is known at most places as Khicdi! But that rice+moong daal version here is alws hit wt hub! I hv to make ur version of S.K someday now..
Dear Divya...Belated , in fact extra belated Anniversary wishes to your Aanu & Amma....really innovative and tempting sweet..my wholehearted appreciations!! !